Textiles and apparel sector has made a significant contribution by providing both direct and indirect employment to almost 35 and 50million Indians respectively, making it the largest employment sector after agriculture. This makes Khadi an important segment for concentrating towards export promotion, emphasised an official release from the Ministry of Commerce and Industry. 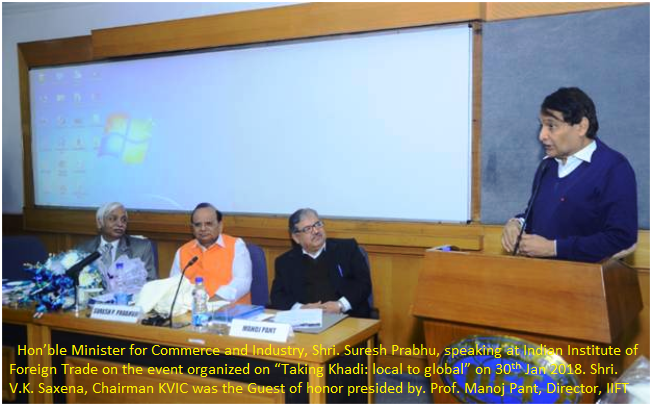 A round table discussion on taking KHADI:local to global was organized by Indian Institute of Foreign Trade on 30th Jan 2018 with support from KVIC and UDAANSKILL. The event focused on connecting the global demand and supply of Khadi, identifying newer markets and product diversification; developing promotional strategies to enter newer markets, inputs on trade policy, market access at WTO front, compliances, design interventions and possibilities of CSR interventions from corporates and PSUs. The minister further added that this round table discussion on �Khadi exports� is pertinent considering the fact that while textile sector being the largest source of employment generation in the country contributing to country�s 15% exports; share of Khadi sector is very low (less than 0.22%) in total textile sector. Hence focus on exports of this sector becomes important.End to end marketing strategy with support from trading houses and academic institutes like IIFT is the need of the hour, he said. Shri. V.K.Saxena, Chairman, KHADI AND Village Industries Commission who was the Guest of honour explained about the diversity of efforts made by KVIC towards promotion of Khadi right from meeting the issues on raw material procurement, wage levels of rural artisans, technological and design interventions and making it a sustainable and export worthy segment. �Its export worthiness also comes from the fact that Indian Khadi earns a lot of water and carbon foot print since it requires only 3 litres of water as compared to 56 liters in other fabrics� said Mr. Saxena. Apart from the supply side constraints for raw material procurement and production, there is also a strong need for establishing a strong demand in global markets. This will require the innovation in terms of diversification in product and market. Lack of product diversification is quite visible through limited export basket of Khadi which currently includes silk and muslin, readymade garments, textile-based Khadi and charkha. IIFT with a strong research capability can contribute towards establishing market intelligence and give inputs on appropriate policy instruments and contribute towards cluster development said Prof. Manoj Pant, Director, IIFT. �Giving boost to export startups, KITTES, IIFT incubation cell would aim at developing new startups working towards Khadi exports� said Dr. TamannaChaturvedi, Co-ordinator, KITTES. Event was attended by Foreign Embassies; corporates including Raymonds, Future group, Aditya Birla, Hero, Maruti Suzuki India Limited; PSUS including LIC, NHPC, HPCL etc, EXIM bank, Amazon India, FICCIrepresentatives of ICHR etc.